LynnCo Supply Chain Solutions, Inc., Lends a Hand to Military Wife and Also, Offers Tips To Families for Shipping Care Packages and Supplies To Loved Ones Overseas. LynnCo Supply Chain Solutions, Inc., helps local military wife that was having difficulty getting supplies to her husband. The LynnCo Team Logistics Experts stepped in collected, packaged and succesfully shipped 52 extra large boxes to Traci Taylors husband and his platoon. Not everyone has the luxury of having a team of logistics experts to help them so LynnCo offers tips to others for safely getting items to loved ones serving overseas. 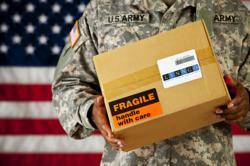 LynnCo Supply Chain Solutions provides tips to Military familys shipping overseas. LynnCo Supply Chain Solutions, Inc. recently collected and shipped supply donations for troops stationed in Afghanistan. LynnCo’s sponsored platoon received 52 boxes of food, clothing, books, toiletries, hand warmers, letters and many more needed supplies. LynnCo first heard about the soldier’s need for supplies from the wife of an Oklahoma Soldier who is serving overseas and was having a difficult time getting them shipped. Dr. Aniysa Fritz, LynnCo Supply Chain Solutions, Inc., Chairman and CEO says, “When we heard about military wife, Traci Taylor’s effort to collect & ship supplies for these soldiers we were honored to help in any way we could. It is the very least we can do for the brave men and women that are fighting for our freedom every single day.” LynnCo understands that shipping supplies overseas to the military is not a simple process. “There are specific procedures that need to be followed in order to ensure that the desired goods get to the correct person.” Says Rob McGrath, LynnCo Carrier Relations Manager. o Fill out the address completely and correctly. This means a specific individual must be named. o List the soldier’s address inside the package in case the address on the box is unreadable or the box is opened or damaged en route. o Number your letters and packages as they may not always be delivered in order. o Identify your package- Customs will need to know what is in each box and quantities. o Never send items that would be irreplaceable or of high value. There is always a chance they could be lost or stolen. o Attach the correct customs form. For example, a package less than 16 ounces and valued less than $400 will need Form 2976.
o Check “Gift” to avoid duty taxes. o Check the size and weight of your package. Your package cannot be more than 84 inches long or more than 130 inches when you total up the length plus the girth. o Your package cannot weigh more than 70 lbs. o Shipping time: A package usually takes between 7 and 20 days to reach its destination. o Do not include items that may melt, leak, explode or turn on. o Separately box food items and non-food items to avoid contamination. LynnCo Supply Chain Solutions, Inc is a privately-held company founded in 1991 and purchased in 2000 by Dr. Aniysa Fritz and Lynn Fritz. Headquartered in Tulsa, Oklahoma, LynnCo is an industry leading 3PL (Third Party Logistics) provider of outstanding client-focused and results-driven logistics programs for many of the top manufacturers in United States. They are well known for their best in class Suite Edge Technology and having one of the highest client loyalty retention rates in the industry. Anisya Thomas Fritz, Ph.D. – is the Chairman and Chief Executive Officer of LynnCo Supply Chain Solutions. Ms. Fritz creative vision has paved the road for LynnCo’s transition from a small-town freight brokerage firm to an honored and reputable global supply chain services provider. A respected scholar, Dr. Thomas is the author of numerous articles on the global system of humanitarian relief, competitive strategy and international entrepreneurship. Her work has been published in leading journals such as Harvard Business Review, Strategic Management Journal, Georgetown Journal of International Affairs and the Journal of International Business Studies.